TOPaaS: Deploy On-Premise Equipment, Pay Like it’s A Service - Four Inc. It is no secret the IT landscape in the federal government is changing rapidly. The transition from agency owned and operated equipment to cloud and Software-as-a-Service (SaaS) solutions is well on its way. The White House has even backed this transition in a major way by recently establishing a centralized Technology Modernization Fund, which eyes cloud as a major goal for agencies. Wow – that is a mouthful – but this model can make purchasing IT hardware and software for your government agency affordable, predictable, and easy. To understand the TOPaaS Model, it is valuable to first understand the key benefits of cloud and SaaS. Cloud and SaaS providers offer customers access to cloud environments via utility-based pricing models. These pricing models enable customers to obtain full use of resources or applications while paying far less than the actual cost associated with funding their own resources, software, hardware, labor, training, etc. Some of the most prominent cloud service providers at this time are Amazon Web Services (AWS), Microsoft Azure, Google, and IBM. These cloud service providers typically provide and maintain the infrastructure needed to run your essential applications. Companies like Salesforce, offer their users a comprehensive suite of applications which are hosted in the cloud, and are referred to as SaaS models. In a SaaS model such as this one, Salesforce is responsible for managing upgrades, maintenance, and security. Thousands of companies just like Salesforce, provide a cloud hosted SaaS offering to both businesses and government customers. Aside from the technical and operational benefits, there are several financial benefits to a cloud or SaaS solution, especially for federal government customers who are dealing with capital budget constraints. One of the main financial advantages to moving workloads to the cloud is that it can shift what used to be capital expenditures - necessary to acquire IT equipment - to operating expenditures, used to acquire a service. The “CapEx” to “OpEx” transition eliminates the need for a substantial amount of a customer’s annual capital budget to acquire new IT equipment. Because of these benefits, the move-to-cloud trend is fast and furious. It is so prominent that is seems EVERY IT solution will one day be consumed this way. However, just about every Federal CIO has gone on record stating that although the movement to cloud is upon us, there will always be a hybrid approach. Firewalls, network devices, and sensitive storage arrays will always have a place within the government’s network. Hence, the TOPaaS model is the perfect arrangement to reap the benefits of a cloud or SaaS model, while keeping critical equipment on the government’s site. What is Technology On-Premise as a Service (TOPaaS)? TOPaaS allows the government to choose any commercially available IT equipment, hardware and or software, and insert it in an “as a Service” payment structure. Should the government want installation services or training those costs could also be bundled into the monthly, quarterly or annual service billing cycle. TOPaaS blends the technical and security benefits of on-premise resources with the financial/budgetary benefits of cloud and SaaS offerings. Through TOPaaS offerings, the government is able to enjoy full use of their IT equipment, which is operating on-premise, while paying monthly, quarterly or annual installments. The government will continue to work with original equipment manufacturers (OEMs) and authorized partners to scope a solution to meet their needs. Once the solution is defined, the customer will engage a federal solution partner like Four Inc. to provide a Technology On-Premise as a Service offering with payment terms and conditions that follow Federal Acquisition Regulations. The RFQ structure is simple as illustrated below. 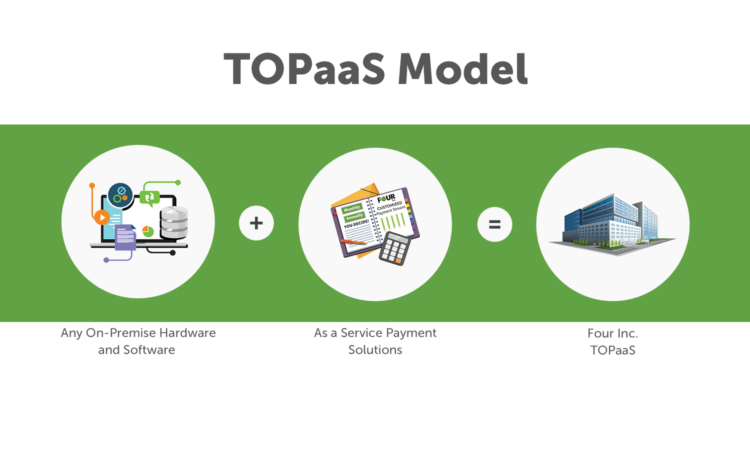 Not only is the TOPaaS model maximizing upfront cash flow for government customers, but it is also helping OEMs, VARs and Distributors provide new value added payment solutions when selling standard COTS on premise products. Based on direction from the White House and huge investments by agencies to capture cost savings and other major benefits from Cloud and SaaS models – it’s clear this modernization trend will continue. To answer the need for critical infrastructure to remain on site while continuing to leverage the benefits of these models, TOPaaS can answer the mail. If you have encountered a situation that calls for a creative model such as TOPaaS, contact us at Four Inc. We would love to start an TOPaaS discussion with you today!